29 Megapixels IP camera with 0.1 Lux of minimal illumination? I have to confess I was a bit skeptical when I heard that an IP camera with 29 Megapixels, 0.1 Lux had been launched , since I haven't good experiences with cameras of only 2 Megapixels in low illumination. CCTV systems are designed to deliver a 1 Vpp video signal over a 75 ohms coaxial cable. Under these conditions, delivered images will have the best signal to noise ratio, dynamic range, resolution, etc. Of course that depends on three factors: lens, image sensor and external lighting. Biggest problem in increasing resolution is that floor area of ​​each pixel decreases. For example, an analog camera (SD) with a resolution of 600TVL which has a sensor with ​​an area of 768x494 pixels (0.38 megapixels) has a sensitivity of 0.1 Lux with F1.2 lens. 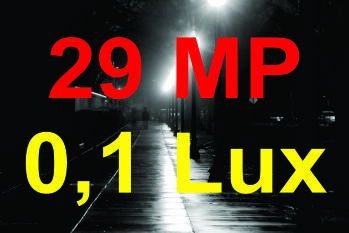 This means that if local illumination is higher than 0.1 lux (measured at the sensor, not at the ambient), that camera will deliver a 1 Vpp video signal at its video output. If this same camera, with the same sensor size, had a resolution of 2 megapixels, i.e. a sensor of 1920 x 1080 pixels (2.1 megapixels) ─ 5.5 times more pixels than on your analog version ─ area of each pixel would be 5.5 times less. This means this camera would be 5.5 times less sensitive to light than its analog version. Its sensitivity would be somewhere between 0.6 and 1 Lux. But in practice, what this means? That HD cameras are slower than SD cameras. Of course, if we consider two cameras using exactly the same technology to manufacture the sensor. If this SD camera in certain lighting conditions, can get a clear image of a car up to 34 mi. (55 km/h), its HD version could only get a clear picture of the same plate and under the same lighting conditions to a maximum of 6.2 mi (10 km/h)! I.e., the more pixels, the slower the camera, more lighting will be need. So I made a theoretical comparison between the SD camera from example above and a 29 Megapixel IP camera (herein after referred to as 29M) using manufacturers' specifications for both cameras (There is more than one manufacturer offering 29M cameras in the market, but specifications are very similar). The 29M camera has 83 times more pixels than SD! Thus, it has 83 times as many pixels, but sensor is 50 times greater. This means that each pixel of 29M is only 60% smaller than each pixel of SD, a much better relationship than 5.5 times of 2 Megapixels camera above. But manufacturers still had the brilliant idea of ​​using lenses of professional SLR cameras, from Canon, which are much better than the best CCTV lens on the market. For example, if we connect a Canon F1.2 lens (the most sensitive available) on a 29M camera, surely the gain in sensitivity will be much higher than the 60% lost of sensitivity due to the smaller size of each pixel. Therefore, it is theoretically possible that this 29M camera can deliver images at 29 megapixels with 0.1 Lux illumination. NOTE: There are other factors that should also be taken into consideration when choosing this camera, such as: Bandwidth, required storage capacity, etc.